Dental care is an important part of caring for your pet. Just like humans, dogs and cats can have teeth and mouth problems if professional dental care is not a part of their regular routine. Aside from bad breath, poor dental health can result in oral infections, tooth loss and damage to your pet’s heart and kidneys. Periodontal disease also results in pain and discomfort for your pet, which can all be avoided with appropriate dental care. Prophylactic dental treatments at Tri-County Animal Hospital along with at-home brushing can prevent your pet from experiencing the major health effects of advanced periodontal disease. 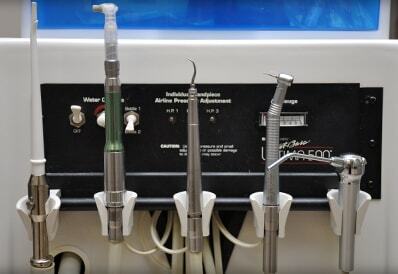 Our prophylactic dental care includes complete ultrasonic scaling, root planing and polishing. We place your pet under anesthesia and perform a comprehensive oral examination and examine individual teeth for mobility, fractures, malocclusion and periodontal disease. We remove plaque and tartar using hand instruments and power scaling equipment, and finally give your pet’s teeth a thorough ultrasonic cleaning and polishing. During examination, it is possible a condition requiring an advanced dental procedure may be identified. The findings will be discussed with you while your pet is still under anesthesia so that you can make the best treatment decision. At home brushing and preventative care is very important. For dogs AND cats, regular at-home brushing is an important part of a good dental program. Brushing your pet’s teeth every day will reduce or eliminate plaque buildup. Our staff will show you how to brush your pet's teeth at home. Brushing your pet’s teeth at the same time each day with a pet toothpaste (do not use human toothpaste) and a brushing device (toothbrush, finger brush, gauze on your finger, etc.) is the most effective means of removing plaque from your pet’s teeth. If you have any questions on how to brush your pet’s teeth, please give us a call. We understand how difficult brushing your pet’s teeth can be, so we can also recommend other home-care options including oral rinses and appropriate chew toys. Regular professional dental cleaning and at-home dental care will keep your pet’s mouth healthy and pain-free for years to come. Proper dental care can increase the lifespan of your pet. 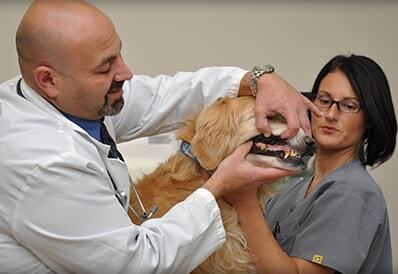 If your pet has not had a dental exam this year, please call us at to schedule a dental exam.